It’s interesting how forecasts for recessions work. Every time there is a volatile market or economic data weakens, the media asks a perma bear, who has been predicting doom for years, to do an interview. The bearish prognosticator states the bearish case with more conviction than usual because of the fear in the markets. Sometimes the bears are correct, but most of the time the headlines scare investors out of winning positions. The same thing happens with bullish prognosticators except stocks go up most of the time, so they are correct more often. You need to have your own process to understand why markets move the way they do. Technical analysis and the economic data provide the stone cold truth. They let you ignore the prognosticators who never change their mind. To be clear, I’m not saying you should never listen to anyone. It’s just that the media often promotes commentators who have an agenda rather than those who change their minds. I’m discussing this topic because currently most economists aren’t predicting a recession, but most CFOs see one coming by 2020. 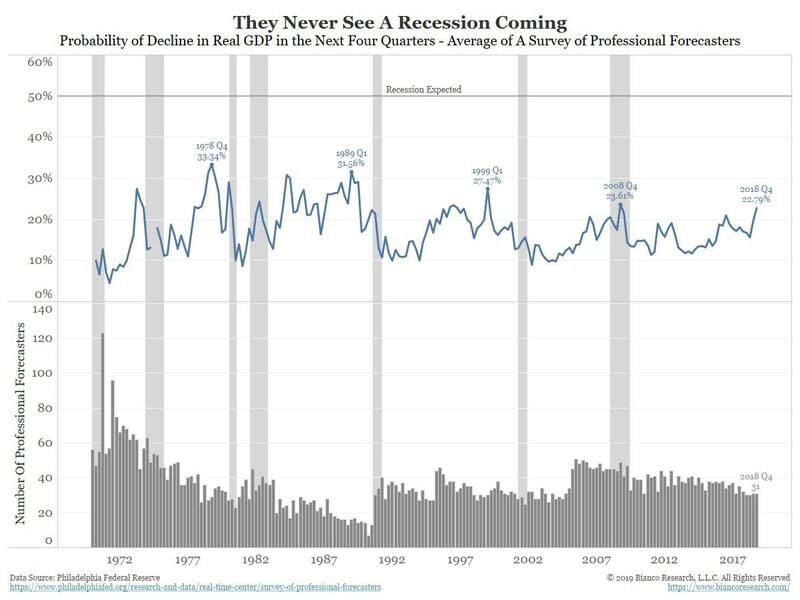 As you can see from the chart above, most economists never predict a recession. Peaks in the probability of a decline in real GDP in the next 4 quarters usually come too early. One exception is the peak in Q4 2008 which occurred after the financial crisis started. Q4 2008 was the worst part of the crisis. Currently, the percentage is at a cycle high. This could explain why there are many recession predictions in the media. Another reason these predictions are popular is because stocks have fallen. Obviously, predicting a recession after stocks have fallen doesn’t do much good for traders. On the other side of the coin, CFOs are very bearish. In December 2018, 48.6% of CFOs stated they think the American economy will be in a recession by the end of 2019. 82% think a recession will happen by the end of 2020. 67% of European CFOs see a recession by the end of 2019. They might be too optimistic as Germany and Italy are likely in a recession now. African CFOs are the most pessimistic as 97% see a recession by the end of this year. Getting back to America, the CFO Optimism index on the economy fell from 70 to 66. Optimism on their own firms’ financial prospects fell from 71 to 69. Both were at cycle highs earlier in 2018. Personally, I think economic growth this cycle peaked in the first half of 2018 in America. It peaked in 2017 for the rest of the world because America had a stimulus. More importantly, I think the stock market peaked for the cycle in September. I’ve been expecting a recession in 2020 for over a year. However, even with this negative viewpoint, I can become bullish on stocks such as in early January. At a certain point, stocks are predicting an outcome that’s too negative. A recession in 2020 is far from a certainty. Therefore, if stocks trade like it’s definitely going to happen, it’s time to buy. Whenever Deutsche Bank comes up with economic risks, I like to mention that Deutsche Bank is a risk itself because of its instability. German bank stocks are down over the past 30 years. Deutsche Bank stock is down over 50% since the trough during the financial crisis. Even though the bank isn’t doing well, its investment research is still solid. 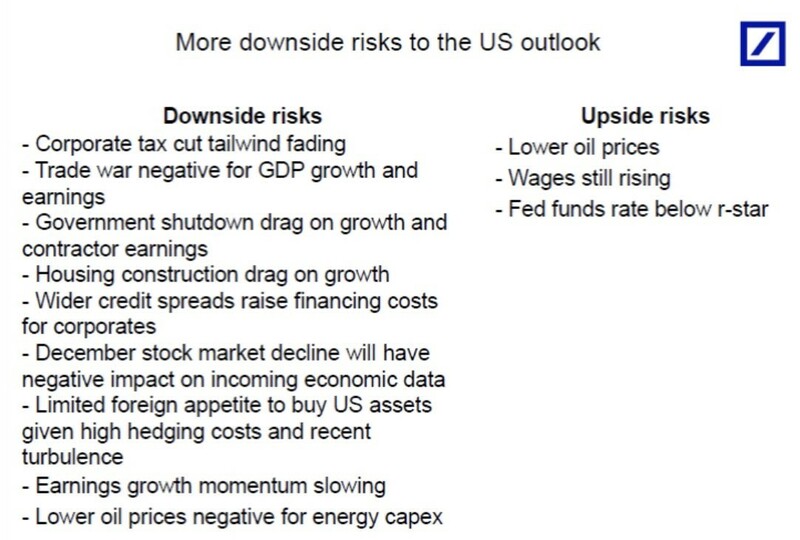 The slide below shows the upside and downside risks to the American economy. There are only 3 upside risks. The first upside risk is low oil prices. This is tough to rely upon because oil prices are very volatile. The only way to assure that oil prices will stay low is if demand weakens. However, weakening demand implies a weak economy which won’t be helped by cheaper prices. The 2nd upside risk is rising wages. This is an understatement because wage growth is accelerating. Real wage growth has also been accelerating. This powers consumption growth which powers most economic growth. Finally, the Fed funds rate is below the neutral rate. This is debatable. The Fed is at the low end of its neutral rate estimates. The good news is the Fed probably won’t hike rates this year. The first negative downside risk is the fading tax cut tailwind. This is no surprise to most investors as the tax cut was a temporary windfall for corporations which went to buybacks. I’m not saying buybacks are bad for the economy, but I am saying the growth boost is almost over. Corporate investment growth is already fading. The second bullet is the trade war. I don’t think this will be an issue for the whole year because I think a deal will be made in a couple months. A key event is when the top Chinese official visits America this month. The third bullet is the government shutdown. This will be a major issue for Q1 GDP growth. Expect a modest rebound after government workers get paid. CFOs and Forecasters - Housing construction might not be a huge risk for the economy. The risk might be left in 2018. Interest rates have been falling and real wage growth has been strong. The housing slowdown might not get much worse this year. Credit spreads were a big issue during the volatility in December, but the situation has stabilized in the past couple weeks. If credit spreads widen because of stressed financial conditions, the Russell 2000 will do the worst because a large portion of the index doesn’t make a profit. I don’t think the December stock market volatility will have a long term effect on the economy. If past volatility prevented future economic growth acceleration, there would never be recoveries. Hedging costs can be a problem, but I don’t think the recent turbulence is an issue when you consider the economic weakness in China and Europe. Earnings growth momentum doesn’t matter. It depends on how quickly earnings growth falls. If 2019 S&P 500 earnings are up 5%, stocks will be fine. If earnings fall 5%, the stock market is in trouble. Current estimates are closer to the former possibility. Finally, low oil prices will hinder oil firms’ capex, but this issue is mainly going to effect parts of the country heavily invested in energy like Texas. 2016 is the worst case scenario as oil prices hurt manufacturing. Stocks already fell more in 2018 than during 2016.